Enjoy the gym and pool areas from 5am – 11pm, year-round! For our Residents 18 years or older. Come check out our beautiful courts. Are you a new resident planning on moving to Calibre Springs? Georgia Natural Gas will be your gas company, Georgia Power will be your electric company, and call the office if you would like to get some recommendations for renter’s insurance. Apartments are pre-wired for Comcast, yet you are able to choose any provider that can verify service to you. To connect to Comcast, please contact (800) 266-2278. Please contact the office if you plan to use a dish-type service in your apartment, as we do have some guidelines for mounting dishes. We are so delighted to have such wonderful residents at Calibre Springs!! 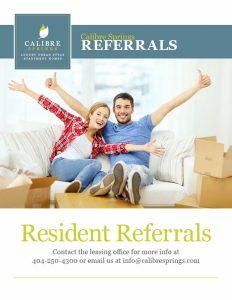 We would rather reward you, more than anyone else, with a cash bonus for referring your friends and family to Calibre Springs!